I like video game toys as much as the next guy. There are even a few toys out there that I'd be willing to pay money for. But twenty thousand dollars seems a bit high. 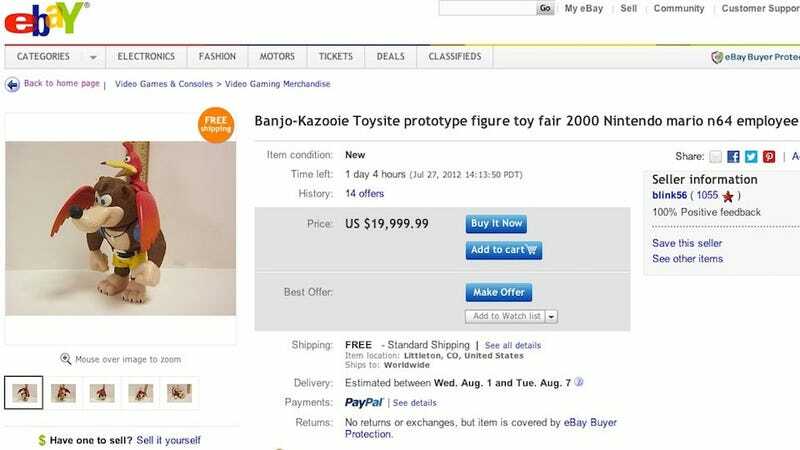 And yet that's the price that this one-of-a-kind Banjo-Kazooie prototype figure is selling for on eBay right now. According to the description, it's a unique prototype from the 2000 Toy Fair. Apart from the figure being one-of-a-kind due to it being a prototype, it is very rare to see a painted prototype at all. The exquisite detail really brings this beloved character duo to life, and it's a true shame the line was never produced. It is a very fragile figure, as it was not meant to be handled or really even produced, so you'll notice it has cheaper paints on it and some of the design had yet to be finalized, like the backpack. This is for display only and not for handling. The paint around the legs may look like it is peeling in the photos, but this is just excess paint that, again, was used to show the prototype painted. The joints were not finalized, so I imagine improper handling could lead to parts falling off or becoming damaged. There is NO DAMAGE on the figure right now. It is a pristine prototype figure in the exact condition I received it more than 10 years ago. So, got $20k burning a hole in your pocket? You've got one day left to plonk down a bid and hope no one outbids you.